within the jewellery, goldsmithing, silversmithing industry and allied crafts. to the Goldsmiths' Craft and Design Council's website. We hope you will find all the information you need, whether it is to enter these nationwide industry awards, find out about sponsorship or if you are just interested in contemporary design. We welcome comments so do get in touch if there is anything you would like to see represented on this site. Please watch our video to learn more about our annual competition. Wednesday 16 January marked the opening of the GC&DC 2018 Award Winners Retrospective Exhibition at The Goldsmiths' Centre. Each year the Goldsmiths’ Craft & Design Council attracts over 600 competition entries from talented UK based designers and craftsmen. This exhibition promotes and celebrates their award-winning work ranging from jewellery to tableware and objet d’art. In addition, this exhibition embraces a feature showcase of competition entrants who have won the highly acclaimed Goldsmiths’ Company Award, which is only given when the highest standards of design and originality have been achieved. The Goldsmiths' Craft & Design Council (GC&DC) is a flagship organisation for the industry that continues to promote, support and enhance skills and excellence across every aspect and activity in the precious metals profession. 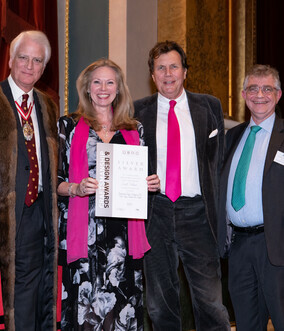 The Council achieves this through its annual competition, abiding by its original remit and primary aim; to promote and enhance excellence in craftsmanship and design.